Why the 2006 Subaru Forester? The turbo 2.5L engine mated to 5 speed gearbox is very fun to drive. Power comes on strong around 3,000 RPM. 1st and 2nd gear are a riot. The first time I really ripped into 1st and 2nd was on an on ramp to the Hudson Parkway along Manhattan's west side. It was right after the freaky Halloween snow storm of 2011, and there was still slush and snow on the ground. This was a used car with tires needing replacement, and even still, it put so much power to ground that I hit redline at 1st and 2nd before I even realized it. That is the amazingness of Subaru AWD and a TD04 configuration. I love driving this combo. One of the biggest reason I bought the 06 FXT was for Subaru reliability. Even reasoning that the turbo would cause high mileage problems, I figured the money I would pay for a used 2006 Forester XT would be less per mile than newer but more boring cars. Plus, it would be money well spent seeing how the car will probably run another 100K at least. The first year totaled about 2K in repairs, but that is about what I knocked off the purchase price, knowing certain items needed replacement at 105K. I personally like the 2003-2008 Forester years (SG model type) much more than the first gen (SF) or 3rd and current gen (SH), which we got for my wife. In particular, the XT has a more aggresive looking front end with very clean and well proportioned looked behind it. I'm 6'1 and it's hard finding cars that I don't have to squat and shift around to see out of. The forester has the best visibility in its segment, no question. This means alot to me as it helps avoid the dreaded 3/4 panel swipe accident. We used to have an 07 Forester X Premium and I loved it, but always regretted not having gotten the turbo. We had that car for 2 years and had ZERO maintenance problems. When it came time to buy a car in 2011, I wanted to go back to that generation of Foresters that I liked more. My father in law has had a Forester since 1998 and had very little problems with it as well. This was a big personal endorsement towards buying Subaru. We've bought two used Foresters in less than a year. Why Not the 2006 Subaru Forester? 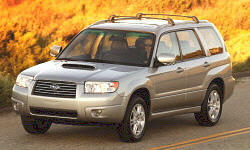 This is honesty the only complaint i have about the 2006 XT. The rear seat is a bit tight. We took three other adults on about a 4 hour trip and it was a tight fit - good thing we're good friends! My wife's 2009 Forester is much better in the rear legroom department. Some people look at the XT's ratings and think 19-24 is horrible AND you have to buy premium gas! Not me. Don't mind it one bit. Do the math: $3 extra over regular unleaded at the pump every fill-up, 4 times a month (although I fill up less), that's $12/month. Multiply by 12 months and you're looking at $144/year! That's nothing to pay for the fun added to your driving experience! Some people pay more than that for one nice dinner out! The stock tires and wheels on this car are not appropriately suited to its sportiness. The ideal, daily-driveable combination is 17" wheels with 225 55R17s or 225 50R17s. The stock alloys are 16" and the tires are Yokohama Geolanders that just squeal all over the place and aren't all that in the rain/wet anyways.